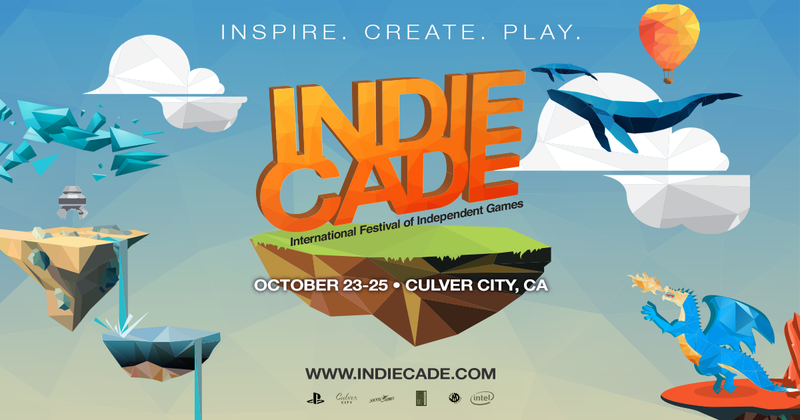 We’re excited to announce a brand-new initiative taking place at IndieCade Festival 2015 – the Gaming For Everyone Pavilion presented by Intel! At IndieCade, we are constantly inspired by amazing people in the independent games scene who work to make gaming a better place for everyone. As a way of supporting these great efforts, we will be featuring up to 10 organizations, groups, or individuals that focus on initiatives promoting underrepresented groups and their presence in gaming and game development. This includes efforts focused on gender, race, ethnicity, orientation, age, disabilities, and much more. We salute Intel for generously supporting these initiatives while working with us to develop this Pavilion. 1. Provide a safe space for gamers of color and gamers of any other marginalized identities (including race, gender, sexual orientation, neurodiversity, disability, etc. 2. Provide a space to promote the work of creators in the gaming industry, including journalists, developers, artists that are marginalized and would otherwise go unheard. 3. To encourage and defend diversity in all forms of gaming, and most importantly, make sure it is done right, by creating conversations that invite both critique and praise for the art of gaming. 4. To promote posts that use a sociological lens to talk about video, tabletop and other forms of games as well as gaming culture, posts that raise awareness of PoC activism and independent projects, and posts that discuss the future of games as a form of media. 5. To maintain journalistic integrity, as well as accountability, to educate, to learn, and to grow. We view diversity as a way to enrich the video game experience, not a quota to be filled, or a tool to avoid criticism. Diversity is essential not just to reflect the variety of our community, but also to push the limits of immersion, to present audiences with a perspective that they have never experienced before, and ultimately, to foster empathy for others. Gamejams can be used to transcend barriers. We can offer non-developers the opportunity to become developers, show developers that they can be game developers, and help game developers do awesome things that can change the world. Dames Making Games is a not-for-profit videogame arts organization founded in Toronto in 2012. DMG offers a wide range of free events, workshops, resources and services to our community of trans and cis women, queer, nonbinary and genderqueer game-makers and their friends, including: Workshops, game jams, monthly social events, multi-week educational programs, studio sessions, mentoring and internships, salons and round tables, publishing assistance, workspace, a zine/book/equipment library, open-source game engine development and more. DMG is entirely member-run and member-funded. Different Games Collective is a grassroots volunteer-run collaborative of a half-dozen core members, as well as an extended network of contributing members and a host of volunteer supporters. Known as the creators of the annual Brooklyn-based Different Games Conference, the collective has broadened our reach to include public programming in other US cities including smaller-scale game design workshops, lectures and more. FemHype offers a safe space for all women and nonbinary folks to discuss, review, and visually share their love of video games. Whether submitting an article, watching our videos on #FemHypeYT, chatting in the comments, or connecting through social media, FemHype aims to feature our voices within a safe, inclusive environment intended for everyone. If you’re a video game enthusiast looking for a sense of community and support from friends both working in the industry and fans of it, this is the place for you! Los Angeles based, HNDP is dedicated to providing an outlet for under-served students to facilitate an entry-point into the music and video game industries. Our year-round programs aim to bring authentic resources, experiences and partnerships to diverse communities and audiences. MidBoss is a games and media production studio headquartered in San Francisco, California. Our projects include acclaimed documentary, Gaming in Color, international queer gaming convention GaymerX and the cyberpunk point and click adventure, Read Only Memories. We’re staffed by professionals from diverse backgrounds, founded on the belief that fun, interesting media can also create an environment where inclusive characters can be a part of mainstream media and beyond. For more information, please visit http://midboss.com. Pixelles is a non-profit initiative committed to helping more women make and change games. We’re based in Montreal, and have already succeeded in building a supportive community of game creators, both hobbyist and professional. The Code Liberation Foundation organizes free and low-cost game development classes for women. So far, Code Liberation has taught roughly 1,500 women at schools including NYU Polytechnic School of Engineering and leading games industry events such at PAX, Indiecade, Games for Change and Two5Six. Furthermore, the organization has run four 22-hour semesters of high school outreach classes in collaboration with NYU Polytechnic School of Engineering and Urban Assembly Institute of Math and Science for Young Women reaching 30 girls between 16 and 18 years of age. Our members have stood as role models within the games and creative coding industries to inspire and encourage women into the field through public speaking events. These appearances have included high-profile venues such as The Game Developer Conference, PAX, A Maze, Indiecade, Games for Change, TedX, The Open Hardware Summit, Montreal International Games Summit, Different Games, Comic Con, and AlterConf. Turning off the Screen’s initiative is to take a closer look at accessibility in game design, development, and architecture in order to open games to an even bigger market. Turning off’s current project is adapting Fullbright’s debut game Gone Home to take a closer look how to modify existing games that have already been enjoyed by audiences in order to look at what goes into universal design. Announcing Year One of the #INeedDiverseGames GDC Scholarship program!